With the wide number of chess variants surfacing today, there is still the allure of playing a fast and furious game of blitz. Known also as lightening or speed chess, this form brings perhaps the most exciting facet of chess right in full view. 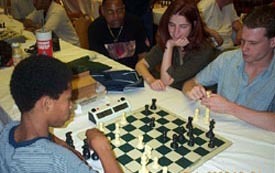 When watching two players blitz it out with pieces flying from one side of the board to the other, the pulse quickens even as a spectator. It's like watching a close basketball game in the closing seconds. Blitz draws endless expressions of "oooohhhs" and "ahhhhhhhs" when mate is thrown on the board or if there is a beautiful tactical shot. At the World Open, the skittles rooms was the domain for blitz. The "Bullet King" GM Roland Schmaltz of Germany showed up giving all comers either 3:1 or 5:1 odds. 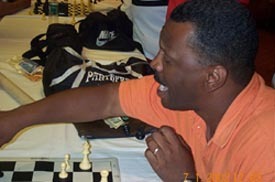 Known as "Hawkeye" at the Internet Chess Club (ICC), he specializes in bullet chess, or one minute for the whole game. In some of the games, he finished off the opponent with 30 seconds left on the clock! GM Schmaltz is a four-time bullet chess World Champion and mowed down everyone that dared to take a shot at his amazing quickness and incredible eye for tactics. 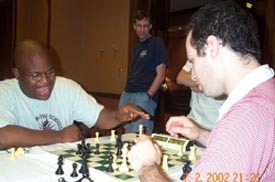 Only Akeem Gregory-Thompson took him into the endgame in an equal position (right). 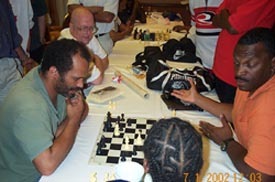 Akeem Gregory-Thompson takes on the German GM, Roland "Hawkeye" Schmaltz, the World Champion of one-minute chess. Jonathan Corbblah is another blitz demon who complements his play with enough theatrics to star in a Broadway play. He spent a lot of time in the skittles room and always drew a large crowd with his innuendos and lively humor. Other crowd pleasers were of course FM Emory Tate, IM Greg Shahade, and WIM Elizabeth Paehtz of Germany. Paehtz had a penchant for singing German patriotic and folk songs. Stakes were also part of the blitz spectacle. Of course many local hustlers were lurking about to prey on an unsuspecting patzer. Some of these hustlers could be seen playing in the wee hours of the morning and playing through the night. When someone said "speed kills," they were right! Some of these players looked dead on their feet. Those who were playing in the tournament had a few matches going. FM Tate played local expert Herbert Carswell and trash-talking was rampant (see below). With all the adjustments to tournament chess with respect to faster play, one wonders what will become of classical play. 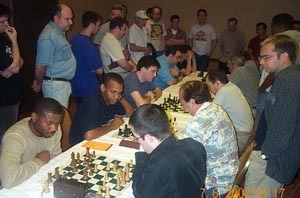 Blitz is definitely an exciting form of chess and draws captive crowds. Internet Chess has also brought an added dimension to blitz play. One would hope however, that in future World Open tournaments there won't be 1000 chess players playing 30 minute games in a giant ballroom for nine rounds. Perhaps this won't happen any time soon, but for casual play, blitz appears to be the reigning king. Editor's Note: The World Open 10-minute blitz tournament (above right) was a big draw as Estonian GM Jaan Ehlvest took first by beating FM Stephen Muhammad. FM Muhammad had beaten GM Pavel Blatny the previous round.